My name is Cristina and thanks for visiting Sylvanian Sweeties! I hope you enjoy taking a look at my collection and that you are having a fun time playing with yours! I started collecting Sylvanian Families when my family moved from Texas to Japan. I was in the 5th grade. I lived there from 1986 until 1990. I received the Sylvanian Families Original 2 story house, lots of furniture and the gray rabbit family (Babblebrooks). My favorite part was the kitchen and I bought Unit House No. 1 to have a bigger one. It was the beginning of an adventure! I made clothes, curtains, took them outside and basically played with them all the time! The next year my sister received many Urban Life items. Included was the very rare Mansion, with furniture, the Ivory Dog Family, the Duck Family and some other original woodland figures. I feel very nostalgic about these items and especially love the items made of copper, the real dried flowers, the working green lamp and fireplace, the grandparent’s glasses, a knitted sweater, a baby raccoon…….. Eventually, I grew up and my Sylvanian village was put in boxes. In high school, I saw Sylvanian Families items at Toys R Us in the US and I picked up a few of the Tomy version in the Clearance section. I was able to get several figures (including my favorite Sibyl Hoppinset) and also the Carrot House. When I went to college, my whole collection went in my mom’s attic and was forgotten. It wasn’t stored well and the Urban Life Mansion was damaged. With the birth of my daughter in 2004, I began thinking again of these wonderful characters and how she might come to enjoy them as much as I did. My sister went back to Japan in 2006 and bought a lot of the new baby line including the Baby Park, many carry case babies, and exchange students. 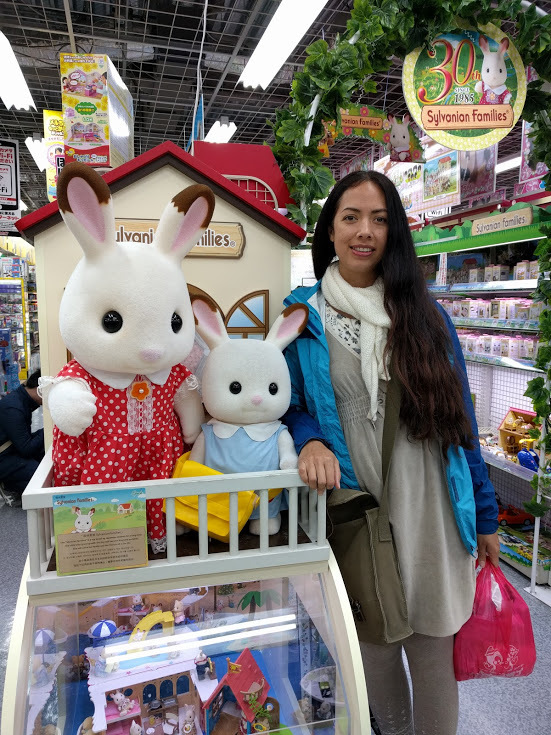 I came to learn about Sylvanian Families in the UK and also Calico Critters here in the US. The Internet has really opened my eyes again to all Sylvanian Families has to offer! I joined the UK Sylvanian member club in 2007. I would love a Japanese pen pal (I took 4 semesters in college) who loves Sylvanian Families to correspond with! Feel free to leave a comment or send me a message at sylvaniansweeties (at) gmail (dot) com. My visit back to Tokyo 30 years later in 2016. Here I am with Chocolate Bunnies at Yodabashi Camera Store at Shinjuku Station.